[[File:InflatableBalloons.jpg|50px|left]] '''Grand reopening!''' '''WikEmacs''' is now under new management and will remain open indefinitely. Spread the word! '''First time visitors''' can start [[#Explore WikEmacs|exploring WikEmacs]]. We have added lots of useful pages since the launch of WikEmacs. Grand reopening! WikEmacs is now under new management and will remain open indefinitely. Spread the word! Migrate content from EmacsWiki. Please adopt the following approach -I found this on EmacsWiki which was helpful. But it took me a lot of time to find it. Now that I have found it, I will put it in WikEmacs so that others can benefit from it. The latest stable release of Emacs is Emacs-24.3. 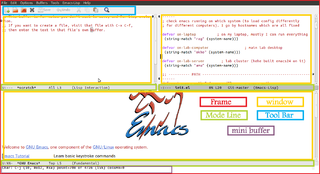 Emacs is available on all popular Operating Systems including GNU/Linux, BSD, OS X and Windows. It supports a variety of programming languages. Are you a maintainer of a Built-in Package? If you don't find information about your package, please add it. No one else is better than you are to write about it.